The updated version of the Sideral boot provides 2.0 times the refinement. La Sportiva borrowed its slick Pegasus buckles from the Spectre to refine the lower buckle closure. A new lower-shell mold has a refined shape, allowing more feet to fit in. Sportive also added new S3 Inserts™ that refine the compatibility. Now you can step into frame bindings, tech bindings, and even the Trab TR2 binding with the same boot. The Sideral 2.0 keeps the most functional parts of the previous version, including the LazerGrip soles, Fast Lock closure system, and lightweight Tour liners. The blend of old and new make for an even better all-around ski mountaineering and touring boot that is light enough to race in recreationally. The Sideral 2.0 is made in Italy, a country shaped like a boot which thusly knows how to make good ones. Vertebra Technology™ provides a stiff link from the cuff to lower shell for good performance. Cam Closure System™ is a one-motion ski/walk transition protected from snow by a window. LazerGrip™ by Davos soles have excellent traction and hardened rubber in high-wear areas. WarmSoles™ are removable polyurethane inserts that insulate your feet from the snow. 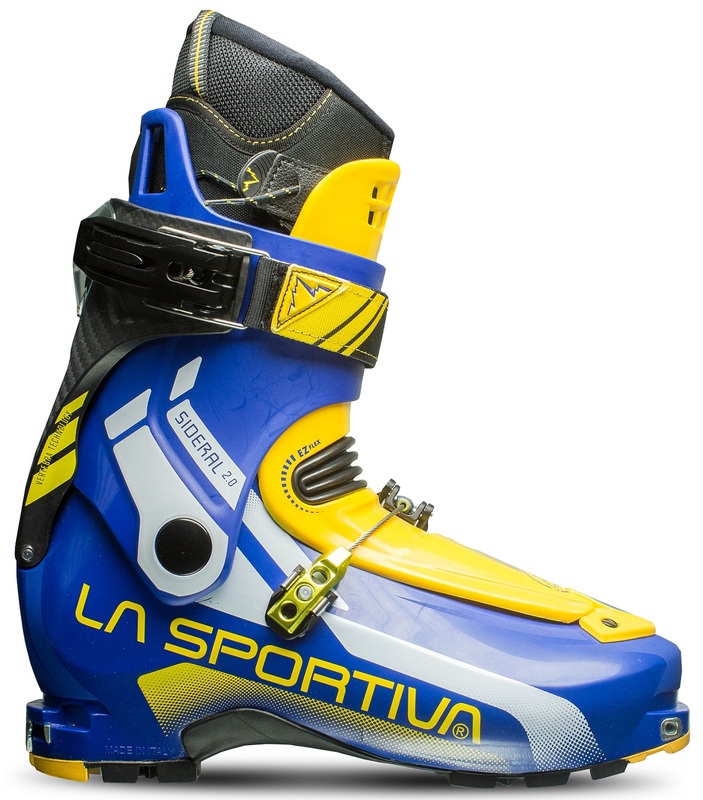 Compatible with tech (aka Dynafit), frame (aka step-in), and TR2 (aka cool) bindings. Grilamid® lower shell and PA12 nylon upper are a good combo of lightweight performance. Pegasus buckles let you fine-tune the lower shell fit to get you heel seated securely. Forward lean is adjustable between three positions so you can adapt the boot to your style. EZ Thermo™ touring liners are lightweight and can be molded with heat or just some skiing. New lower shell mold has less rocker so as to fit more feet and crampons. Is the Sideral 2.0 boot compatible with frame type at bindings such as Marker Duke or Fritschi Freeride? Would these be enough boot to drive a bigger ski ~108 underfoot through heavier snow? Or would I be better off with a Maestrale etc? Hi Erik, that's a bit much to ask of this boot, but the Spitfire 2 could likely handle it, depending on exactly which ski and your style. Maestrale RS, no problem. Does the Sideral 2 fit the same as the original Sideral? If not, what is the difference? Thank you. Hey Bill! Yup, they're the same! Hi apologies for duplicate questions in advance - does the Sideral 2 have the same fit as the Spitfire 2.1? If there is a difference, is it possible to describe it? (Primary motivation is cost in asking the question). Thank you. Hey Bill! No worries, too many questions never hurt anybody. Yup, the lower shell between the two boots are identical (maybe not under a microscope or down to the molecular level, but as far as the shape it should be the same). The Sideral 2.0 includes a thicker liner which gives it a slightly lower volume fit than the Spitfire. The new walk mechanism on the Spitfire makes it substantially stiffer than the Sideral 2.0, however it's also a lot more expensive. What's the deal with the walk/ski mode lever on this model? Sportiva makes the Sideral out to be a softer-flexing, less-expensive version of the Spitfire at essentially the same weight, but the Spitfire's locking mechanism is a giant lever and this appears to be a fiddly little thing behind a plastic window. I'm touring in a Salomon MTN Explore right now and am pretty frustrated with them, as the forward range of motion is poor (my shins bonk the front of the boot, even with heel lifters engaged, while skinning up moderately steep slopes) and the walk/ski mode lever CONSTANTLY flips back into ski mode while I am touring. Trying to make sure these won't put me in a similar situation, where I'm constantly having to reach down and unlock my boots! Hi Jeff, sorry about your troubles with the MTN Explore, yes they don't walk as well as some others. The Sportiva system has been in use for a few seasons and seems to work well. You'd have to accidentally close your upper buckle to go into ski mode...unlikely. The little window keeps snow out of the mechanism. Baring the cable breaking (which would thankfully lock you into ski mode), this walk mechanism is, in my experience (through the wringer), fool proof. I ski these in a TR2 on a 95mm waist and a Trab Race on a 65mm waist and love every minute. Light and plenty strong for me. Nice feeling flex for a lightweight touring boot. Single motion change. I love the pegasus buckle. Huge and frictionless ROM. I am planning on using these with a pair of Icelantic Keeper skny 184's (90mm waist) and the trab TR2 as a do everything package. Is this a wise move for on piste skiing? Coming from a ~100 flex (6 tongue) Full tilt that feels plenty stiff to me am I in for a rude awakening? most of the touring I plan to do involves a lot of low angle rolling terrain so the long rearward rotation of a 2 buckle boot seems very desirable, but I do not have a feel for what this actually will cost in downhill performance. Dane H, We still have not received our sideral 2.0. If the boot keeps the same flex as the 1.0 (which it is supposed to) I would think it would not be a rude awakening but still it will be a bit softer than your current Full Tilts. In soft snow and rolling terrain I would not see a problem with this boot. Charging in or out of bounds might be a bit soft, if your worried you could go with the Spitfire 2.0 which would be as stiff as your current boots. And its in stock now. So far have only skied inbounds but I can say that they ski plenty strong for me. Very happy with the boot! Availability says mid December, are they available now? Hi Dane, thanks for pointing out the stale time frame. Our latest info shows a mid-January ship date. The Spitfires arrived though! Gah! tell those Italians to hurry up, I want get my TR2s mounted up for these beauties! Hi Martin, yeah it would be easier if there were clear categories. We generally classify these as light 2-buckle touring boots with excellent articulation and easy transitions, joining the TLT6 Mountain, SCARPA F1 Evo (currently on hold), and Atomic Backland. Some of these have a "performance" versions that have material upgrades but are otherwise the same design. That would included the Spitfire and TLT6 Performance. Then there is a somewhat big gap in terms of weight and efficiency till you get into boots like the Spectre, Khion, and Maestrale, which tend to be a touch stiffer and wider. Hope this clears it up a bit. Renderings are all blue, but photos/videos of samples look purple. Any way to determine what the official color is? Comment from Sportiva? Hi Dane, good eye. I can't verify in person yet since these haven't been shipped. However after asking around, I just updated our main image to what should be the production color: a more primary blue. The back and front views aren't available in that color yet unfortunately.